Leading Manufacturer of woven fiberglass roving, fiberglass roving and fiberglass rope from Ahmedabad. We are a prominent Woven Fiberglass Roving tapes manufacturer and supplier based in India. We are the leading manufacturer, supplier and importer of Woven Fiberglass Roving cloths. 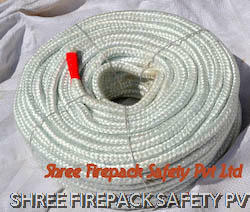 Shree firepack safety pvt ltdspecializes in offering qualitative range of Woven Fiberglass Roving ropes.Also our range of product include like yarn, ropes, cloth,webbing tapes,fire blanket, aprons, suits,welding blanket,coated & uncoated fabrics made of asbestos,non asbestos material like glass fiber, cermaic fiber & silica. We are a prominent Fiberglass Roving cloth manufacturer and supplier based in India. We are the leading manufacturer, supplier and importer of Fiberglass Roving tapes. Shree firepack safety pvt ltd specializes in offering qualitative range of Fiberglass Roving ropes.Also our range of product include like yarn, ropes,cloth,webbing tapes,fire blanket,aprons,suits,welding blanket,coated & uncoated fabrics made of asbestos,non asbestos material like glass fiber,cermaic fiber & silica. 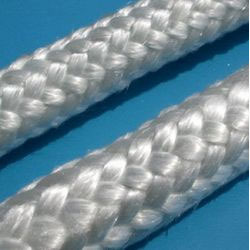 The Fiberglas Rope is braided from a number of texturized glass fiber yarns. The diameter of the rope is determined by the number and thickness of the yarn being used. Fiberglass rope are made from high temperature fiberglass for 1000°F level applications. They have outstanding thermal resistance, high tensile strength, low thermal conductivity, and excellent chemical resistance. Fiberglass rope are durable, resistant to mildew, and have no hazard to health. The normal reinforcing material selected is stainless steel wire, which is of good performance and cost effective. Used in stove door seals, oven and stoves, blast furnaces, thermal insulation of electrical wire, wrapping of pipes.